Raid, plunder, and die gloriously in battle. Vikings, prepare to raid settlements, take plunder and make offerings to the chieftain. 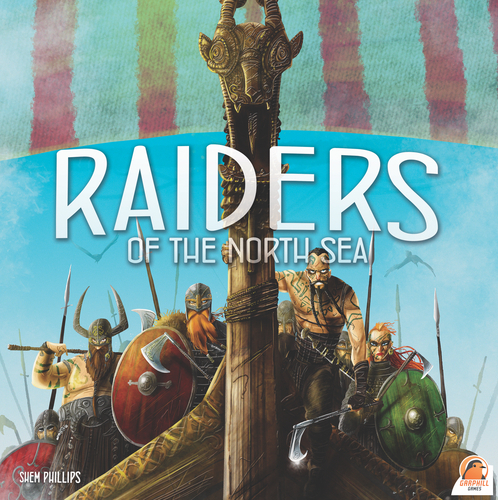 In Raiders Of The North Sea each player will need to hire a crew, amass provisions and gain armor. Then they will set off to raid harbors, outposts, monasteries, and fortresses. Harbors are the easiest to raid, but yield less plunder. Fortresses are hard to raid, but provide the most plunder. After a raid players may need to reload crew and provisions to get ready for the next raid. Provisions are necessary in order to launch raids. Sometimes, alas, players can lose crew members in a raid. Crew members not returning from raids earn Valkyrie, and Valkyrie can earn points. Raiders Of The North Sea is a worker placement game. It has a great twist in the way it works. 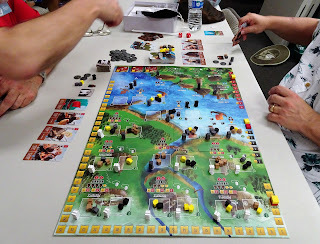 On each turn a player will place a Viking on an action space performing the respective action and then remove a Viking from another action space performing that respective action. There are 3 different color Vikings and each is effective only on certain action spaces. The Viking removed for the second action is the one that will be used to place at the start of the next turn. This creates some interesting tension, i.e. a player needs a gray Viking for the next turn, but the action they want to take is occupied by a black or a white Viking. The winner of the game is the player with the most points. The player with the most points is the player that raids the best and uses their plunder to best to gain victory points. Some points can be gained by raiding the various locations. Those points can go up by having a more successful raid using more armor, stronger crewmen, and a little luck with the dice roll. Points can also be gotten by using plunder to make offerings to the Chieftain. There are 3 offering tiles available requiring a mix of plunder to be satisfied. Points are awarded for purchasing substantial amounts of armor. Additionally, points are awarded to earning a lot of Valkyrie. Therefore, losing crew members isn’t all bad.